Amador Publishers, and four of our authors -- Zelda Gatuskin, Michelle Miller Allen, Adela Amador and Harry Willson -- took part in the New Mexico Book Co-op store at Cottonwood Mall. Here is Zelda's account of the experience, and we offer it here, as a way of continuing to support the effort. "If people can find our books, they will buy them!" The statistics have been well publicized by now. Open a mere 40 days (Thanksgiving through New Year's) the New Mexico Books & More store at Cottonwood Mall sold more than 3,400 books by local authors and publishers, hosted more than 100 book signings and special events, and involved nearly 200 members of New Mexico's literary community in a volunteer effort which raised $5,500 for local literacy projects. The publicity is a statistic in itself, with well over 100 mentions in the media (including Publisher's Weekly)--and the store is still getting coverage even after it's closed. By what miracle did our eclectic and sometimes fractious collection of 'independents' come together to make book selling history? Start with shared frustration, verging on desperation, over the difficulty of getting bookstores to carry our books. It seems like a winning combination, doesn't it--local book, corner bookstore? But when that corner bookstore takes up the entire block, and purchasing is handled by 'headquarters' in a faraway city.... Let's just say that nothing dulls the glamour of being a 'published author' quite like carrying a case of books into the bookstore yourself and then taking it home again (hopefully a little lighter) when your stint at the signing table is up. Get folks talking to each other. On the final day of Small Press Week 2004, a dozen of us gathered for lunch in the Board Room of the Albuquerque Press Club. Added to the SPW agenda at the last minute, this informal meeting offered a chance for writers and booksellers to 'talk amongst ourselves.' The small but diverse group aired complaints, commiserated, found common ground, and brain-stormed. We might have spent the whole afternoon batting around ideas, but when fellow authors started their afternoon talks we adjourned to join them. The meeting had yielded little in the way of concrete plans, but it concluded on a note of mutual support, and with an exchange of e-mail addresses. Find a Fearless Leader, or two. Enter the dynamic duo of Paul Rhetts and Barbe Awalt. As owners of LPD Press, which has been producing and marketing richly illustrated books about Southwest art and culture since 1984, and publishers of the quarterly Tradicion Revista, this couple has proven they know how to get a project off the ground, and keep it aloft. 'Can-do' spirit exudes from them, and if it comes with an air of combativeness, that's because they've tried about every angle on book selling and lived to tell about it. They've learned that locally produced books do sell, if the public can only find them. Armed with that conviction, abundant skills, and the wisdom of experience, Barbe and Paul selected one of the ideas put forward at our lunch, something that hadn't been tried before, and set out to make it a reality. But before they could create a cooperative independent press bookstore, they would need to pull together an independent press cooperative. Shake well. Voila! The New Mexico Book Co-op coalesces in support of Paul and Barbe's effort. Ruth E. Francis calls it synergy. Ruthie has served on the Board of Directors for the New Mexico Book Association (NMBA) for the past six years; and as a former Director of Community Relations for Hastings (1996-2003) and for Book Star on Louisiana prior to that (1991-95), she knows what authors are up against. 'Most chain stores do support a regional section, but it's not emphasized.' Ruthie explained that bookstores want to work with big distributors and have difficulty with single presses. 'It screws up the database....The problem with the chains is that they run the store as if books are widgets.' Titles with no sales in a six-week cycle are flagged for removal, and it's simpler to trade books in and out through a distributor; books that aren't in the system never make it to the shelves at all. However, a track record is a track record. Ruthie thinks that the success of NM Books & More will raise interest in local titles. Ruthie has a passion for books and for helping authors sell their books. She volunteered her time four afternoons a week at the NM Books & More store for the entire six weeks of its run, and called the experience joyful. Ruthie's sentiments are echoed by other bookstore participants. Whether they sold one book at the store or a hundred, all of the authors I spoke with were enthusiastic about the experience. Such a positive outcome was by no means preordained. Experimental on many levels, the co-op store as conceived by Paul Rhetts and Barbe Awalt, had two simple goals: to showcase books and to sell books. Participants were asked to chip in a $20 fee and work one eight-hour shift per title placed in the store, and would receive 60% of the jacket price of all books sold. To encourage sales, every item was then marked at a minimum 15% off, with co-op participants and libraries receiving an additional 10% discount. The slim margin remaining would make up the balance of rental expenses, with any profits going to charity and to create a small reserve for future co-op activities. There was no money allocated to either payroll expenses or advertising. No kidding. The most dicey part of the plan involved a rotating staff of volunteers'authors and publishers themselves ringing up the sales. It did not go perfectly. Co-op participants were peppered with e-mails from Paul reminding us to be on time for our shifts, to print clearly on the checks and charge slips, to make sure to mark the inventory sheet. Paul told me that his work on the accounts 'was more than it needed to be because of the inconsistencies with the process.' He added, 'Ruthie Francis provided a professional presence and desperately needed continuity....I honestly wonder if we could even have pulled it off without her.' Paul said that if he had the opportunity to recreate the store next year, he would change the model from all-volunteer to having two or three paid staff to run the register and sales. 'The work requirement would still be there, but it would be different.' Volunteers would be floor people instead of cashiers. Authors who did know how to sell their books put extra time into the store, dropping in a for a few minutes, a few hours, or full shifts to get the most out of the opportunity. They saw results, too, while other authors had the chance to watch and learn. In fact, one of the things participants most liked about the store was getting to meet and mingle with each other. For six weeks, the NM Books & More store served as an impromptu club house for local bibliophiles. 'It was one of my favorite places to stop in and visit. You never knew who'd you meet there,' said Cottonwood Mall Manager Carol Wilbur. She shopped there herself, picking out children's books, mysteries and local titles. She said she'd had numerous calls from people wanting to know where the store was located. Someone even suggested she put a banner on the outside of the mall to indicate the nearest entrance to the bookstore. My shifts at the bookstore came early in its run, but the cooperative spirit was already taking root. I felt that as each new author/publisher came in, and we introduced ourselves and pointed out our books, our 'investment' in the store expanded to encompass not just our own books but each others'. I decided to check back with some of my new friends after the store closed to see how their books had sold, and what else they had to say about the project. Ruben Archuleta had three books in the store, I CAME FROM EL VALLE, LAND OF THE PENITIENTES, LAND OF TRADITION and Epie Archuleta and THE TALE OF JUAN DE LA BURRA, all self-published under the El Jefe imprint. PENITENTES did the best, making the bookstore's 'top 50 bestsellers' list. 'I was okay with the sales,' Ruben told me. But we agreed not to do a cost analysis on the overall effort, which included four trips from Pueblo, Colorado with his wife Joan'not the easiest trek in winter months. Nonetheless, the intrepid former Chief of Police braved yet another snowstorm to attend a wrap-up party for the bookstore at the end of January. He said that he and Joan, 'loved working the store. The best part was the people we met, especially the numerous authors and people involved in the store.' 'I learned that there is a lot of competition out there and networking is an essential tool in marketing your product. I was also humbled by the quality of authors and their books.' Ruben intends to stay involved with the co-op, and is content to keep self-publishing. P.O.D., or 'publish on demand' is another way authors get their manuscripts in print when Simon & Schuster et al have declined to snap them up. It's a promising business model'printing books as they're ordered instead of sinking a huge investment into producing and warehousing them by the thousands. Unfortunately'you guessed it'big bookstores are not dealing with P.O.D. presses, as Gail Ruben discovered after she'd already released her book using a P.O.D. publisher. As a public relations professional, she didn't feel she needed a big company behind her to market her book'but she was kind of counting on it being in stores. She eagerly signed on to the NM Book Co-op, which she heard about through Southwest Writers Workshop. Barbarba Kline Hammond agrees. She and her husband Jim Hammond each had a book in the store, and though they didn't sell a lot, they were both 'really enthusiastic about the opportunity,' and the cooperative effort of the authors. 'This co-op program really created a big stir and I'm thrilled to be part of it.' Like many of us, Barbara did some shopping at the store too. She picked out some books she thought might sell alongside her own title, CANCER'S GIFTS: MEDITATIONS ON BEING HEALING, AND FORGIVING, and Jim's novel, THE PHOENIX SOCIETY, at her Serenity Gardens day spa and gallery in Corrales. Until the co-op came along, she hadn't considered selling books by others. Hubert Allen also came away from the bookstore with some new ideas about book selling, but he's holding them close to his chest for now, calling them, 'Corporate secrets!' It was fun to meet up with Hubert again at the store, where we congratulated ourselves for having been there when it all began, at that lunch back in June. Hubert had come to that meeting with a printed manifesto: 'Fairness and Opportunity in the Book Marketplace: Does the Small Guy Have A Chance?' detailing his frustration at not being able to place his book, PETROGLYPH CALENDAR: AN ARCHEOASTRONOMY ADVENTURE, at the Petroglyph National Monument. I checked back with Hubert to see if the book co-op had helped him advance this particular cause. He reported that The Petroglyph Calendar made it to No. 40 on the store's bestsellers list. Okay, let's talk about intense. Andrew Davis has got one of those larger-than-life personalities that leaves you a little breathless. Whatever he's doing, he is doing it one hundred percent'make that a hundred and ten'and that includes making it clear that he's no poster boy for self-publishing. I had met Andrew at the store, and found him to be a genuinely nice person, so I wasn't too alarmed when he just about jumped through the phone to tell me how he felt about the book business: He hates it! Hates marketing, hates retail and hates self-publishing. The former television lighting director told me he had self-published his novel, GOD BLESS MR. DEVIL only intending to get it in front of a bigger publisher. 'Everybody that read it thought it was a killer story.' So when 'New York' wasn't buying, Andrew decided to, 'just put the son-of-a-b in print.' Four years later, Andrew still believes in his book, 'a story about the power of love over evil and how an eight-year-old child changes the world.' He devoted a full-time effort to the store, averaging about eight hours a day there for the entire run. And did he ever, catapulting GOD BLESS MR. DEVIL to No. 2 on the top seller list, with over a hundred copies sold. I wondered if that would inspire him to redouble his marketing effort. 'No! My efforts are redoubled already!' Despite his success at NM Books & More, Andrew's still not interested in dribbling out books directly to the public. He'll settle for nothing less than 'blockbuster bestseller' status. Given all of that, I speculated that going to the store so often must have been a drag for Andrew'but I was wrong again! Is this unbelievable, or what? You'd think there'd be more whining from folks who most likely prefer sitting at the computer in their jammies to milling around a shopping mall. Maybe it was a miracle. Andrew did admit that his knees and feet were killing him. Ruben and Joan complained about the temperamental credit card machine. Gail and others, including myself, didn't have very successful signings. Just like at the traditional bookstores, it took a lot of name recognition to draw a crowd for official appearances, and a lot of chutzpah to flag down casual passers-by. So we had the curious situation where time at the store was generally rewarding, but for some the book signing itself fell flat. Some authors had to purchase copies of their books from publishers who were unable or unwilling to participate directly, in order to place them in the co-op store. After the fee, the work shift and the co-op cut, there was little if any room for profit. Yet they eagerly signed on, seeing the value in having their titles included, building that 'track record' for sales, and networking with other book people. Many of us put in an effort that exceeded immediate financial returns, but because that translated into a direct contribution to literacy charities, and supported a coalition with tremendous potential, the result was surprisingly gratifying. And what was Paul Rhetts' biggest complaint about the NM Books & More store? Paul estimated that while the store was in operation, he and Barbe put in a combined 15 to18 hours on it every day. One of them always opened the store and one of them always closed, and when shifts weren't filled, or fizzled (a few recalcitrant volunteers actually got fired and sent home with their books) you can guess who stepped in. As a business endeavor, Paul said that their own press certainly sold enough books to make it worthwhile. Their SAINTS OF THE PUEBLOS made it to No. 18 on the top seller list. Paul is pleased that the store met its goals of showcasing and selling local books. In the process, he achieved a personal goal as well: 'To prove that it can be done.' He said he has tried for years to get a book fair off the ground in Albuquerque but there were, 'Too many people with too many different requirements....Politics, turf, massive expectations that came with lots of dollar signs....Small presses couldn't afford it.' Paul thought it should be easier for people to participate. Now, with the bookstore success in his back pocket, the media hooked, Cottonwood Mall delighted to host the NM Book Co-op again, and Barbe at his side, Paul is ready to make his dream come true. 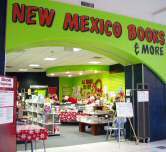 The New Mexico Book Fiesta will be held Saturday, May 7 (the day before Mother's Day) on the lower level of the Cottonwood Mall, where vendor displays are expected to stretch 'from Dillard's to Foley's.' Once again the plan is experimental, and Paul is opting for a single-day event to test the waters. He'd rather leave 'em wanting more than overreach. Paul is tickled pink (really, with a great big smile) that media outlets have been coming to him to find out what's next for the NM Book Co-op. And it's not only the media that's getting on board. The New Mexico Endowment for the Humanities will be one of the sponsors for the Book Fiesta in May. Meanwhile, what better way to insure success for future ventures than to teach authors and publishers how to be more effective at selling books? Paul and Barbe plan to keep the co-op active with a series of monthly lunch meetings and topical talks ('Better Booksignings' will be the subject for the first session). The second-Friday-of-the-month meetings in Albuquerque will be co-sponsored by the NMBA and compliment their long-running last-Friday-of-the-month lunches at Tiny's in Santa Fe. Paul Rhetts and Barbe Awalte have demonstrated what a good job they can do organizing an unruly bunch of book people'and we're never going to let them forget it! I asked Paul if he was comfortable continuing their level of involvement with the co-op, and if the effort was cutting into time on LPD projects. He acknowledged that, 'The time taken to make a co-op and bookstore has taken away from the time we can put into the press, but at the same time it's invigorated us to do more.' As long a the co-op is fulfilling its goals, Paul continued, he and Barbe are willing to keep at it. He noted that by using e-mail he can manage a long mailing list (currently 580 names and growing) with zero expense. True, but e-mail doesn't write itself. Paul and Barbe's willingness to keep co-op participants in the loop with frequent and informative e-mails, sharing detailed information about every aspect of the store's operation and performance, has certainly contributed to the positive appraisal of their experiment. Paul eagerly puts store participants in touch with each other, welcomes questions and feedback, and appears undaunted at having a few hundred new pen pals. He'd prefer for the co-op's structure to stay as informal as possible. So far, he said, each time they have put out a call for help, co-op members have stepped up to the plate. 7. GREEN CHILE BIBLE cookbook by Albuquerque Tribune, ed. 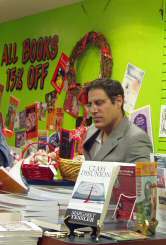 Jonathan Miller spent many hours at the store. His novel CRATER COUNTRY was the store's No.4 top seller. Attention NM Book Co-op Participants: If you are mentioned in this article and have a web site, I will be happy to add your link. If you are not mentioned in this article, your URL may still belong on one of Amador's other Links Lists. Please send e-mail to Zelda with your link.